The last time I checked, a pharmacist's job is to prepare and dispense drugs, as directed by physicians. I thought they were in the position to serve people needing medication, rather than advise or make choices for them. But, according to a new state Board of Pharmacy proposal, pharmacists have the right to decline prescriptions that are in conflict with their beliefs. That's news to me. According to the P-I story, "The proposal gives pharmacists the right to decline prescriptions that are in conflict with their beliefs. The ruling is the result of a long-running controversy about Plan B, the emergency contraceptive -- also known as the morning-after pill." The proposal does require pharmacists to "provide timely alternatives for the patient to obtain treatment." That could amount to little more than telling the patient to try another drugstore. This is a slippery slope. What other drugs can conflict with a pharmacist's beliefs? Will the Scientologist pharmacist refuse to administer anti-depressants? 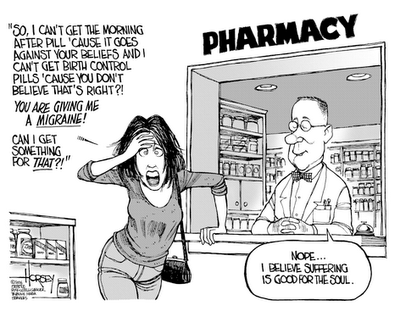 Will the Catholic pharmacist refuse any form of birth control? In the words of KOMO's Ken Schram, "...If pharmacists are allowed to use their religious convictions as a litmus test for dispensing medications, why doesn't the state board just come out and recommend prayer over pills? Or maybe those religiously-driven pharmacists should have become ministers instead of heath care providers."